Lesser men who can’t afford a horse gather in units to perform supporting tasks on the battlefield. 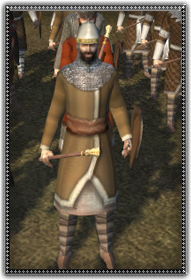 Armed with light maces these men can be used to counter enemy archers and light spearmen. They will melt away quickly though confronted with cavalry or heavy foot soldiers due to their lack of heavy armour.